A few weeks ago there was some discussion on Book_Arts-L about this peculiar style of binding that seems to have been mostly applied in German binders beginning in the 3rd quarter of the 19th century. 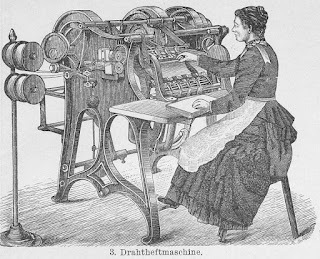 Hugo Brehmer (1844–1891) who emigrated to the US from Lübeck, Germany is said to have developed the first machine in the US in 1875 that his brother August (1846–1904) is believed to have "perfected." A patent was supposedly issued in 1872, but I have not been able to locate that in the US Patent Office database. The first book produced this way is said to be the official program for the 1876 World's Fair in Philadelphia, PA. In 1879 he returned to Germany, this time Leipzig where he continued with the development and commercialization of his wire binding machine. 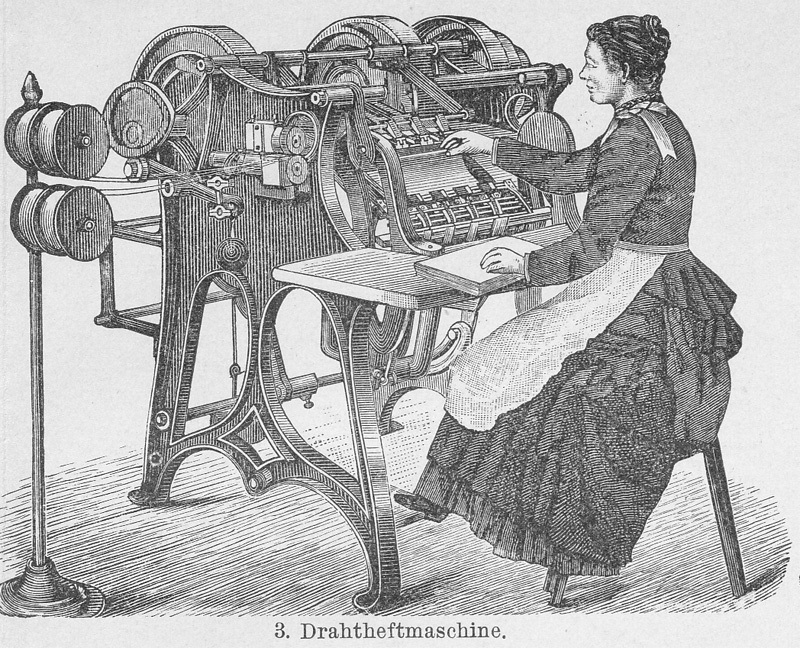 Brehmer is also credited with developing the first mechanical thread-based sewing machine in 1884. 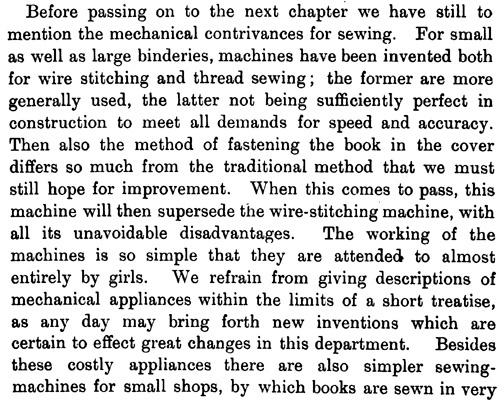 George Stephen's Commercial Bookbinding (London, 1910) available from the Internet Archive has good English language descriptions of the various kinds of wire binding machines that were in use at the time. Sections describing the wire binding begin on pages 5 and 19. Thank you to Jeff Peachey for pointing me to this text [Added, 5/16/2011]. 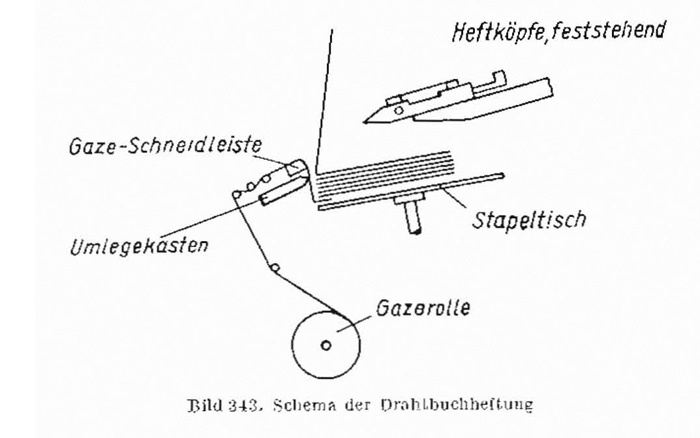 In this country wire is not used to any appreciable extent for the sewing of letterpress books, but in Germany books are commonly sewn with wire. Machines for doing this work are necessarily more complex in construction than wire-stitching machines. 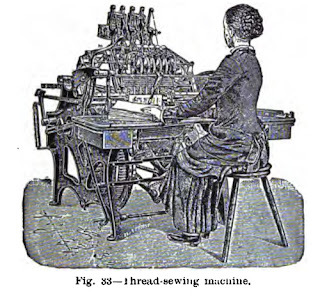 A typical wire book-sewing machine (Fig. 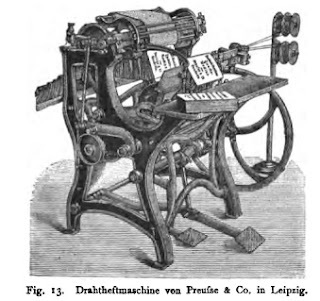 18) is that made by Mr. Aug. Brehmer, which is used for the sewing of many important publications, including Baedeker's Guides and Brockhaus's Konversations Lexikon. This machine is equally suitable for letterpress work, guard hooks, pattern books, post card albums, and similar work. The machine is fed automatically from spools by small steel rollers and at each revolution as many U-shaped staples are produced as are requisite for each section. A section, having been placed on an oscillating table, is brought into position for being sewn. 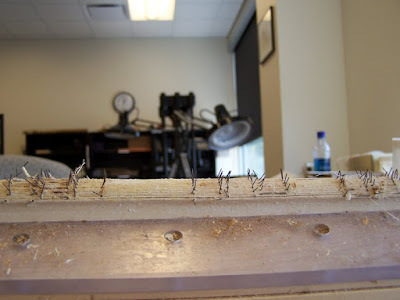 The staples are driven from the inside of the section through the fold and through the tapes or open fabric which is stretched and firmly held by clasps directly opposite to each staple binder and inserter. The projecting legs of the staples are clinched over, thus producing a firm connection between the section and the tapes or fabric, whichever is used. In order to reduce the swell in the back of the book which would be caused if the staples in the various sections were all inserted in a corresponding position, the machine is so constructed that each staple forming apparatus has two or three shifts whereby the staples in adjoining sections are inserted in different positions so that there appear on the back two or three times as many rows of staples as there are staples in each section. Fig. 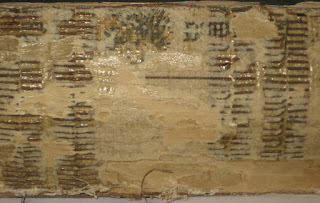 19 [not shown] illustrates the positions of the staples in a book that was sewn when the machine was arranged for three shifts ; for the sake of clearness the backing material has been omitted from the illustration. 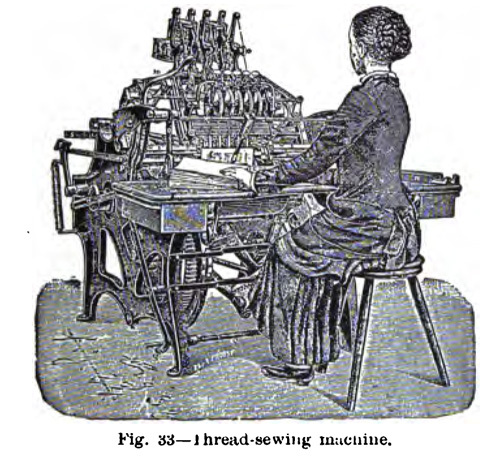 It is estimated that about 2,000 sections per hour can be sewn on this machine. There is no doubt that this method of sewing is very strong; indeed, so firmly are the sections held together that usually the books thus sewn have not that degree of pliability possessed by books sewn with thread. 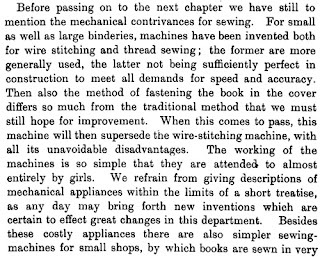 Another objection to wire-sewn books concerns the binder: when it is necessary to rebind such books, the girls in "pulling" them are exposed to the danger of having their fingers torn by the staples. The greatest objection, however, to wire-sewn books lies in the fact that sooner or later the wire will rust and rot the paper and the back fabric to which, it is secured. 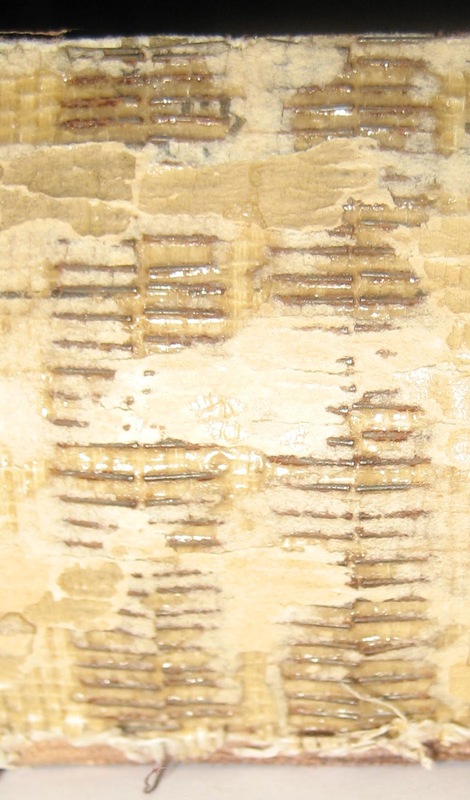 so that the book will fall to pieces and cannot be rebound without first repairing every fold- an expensive method which would only be adopted for rare and valuable books, because if the book were in print it would generally he cheaper to procure a new copy than to pay the cost of repairing the sheets. Doubtless if only alumenoid wire were used this latter objection would be removed, but as this wire is expensive, its use is chiefly confined to the sewing of books that are to be sent to the East The various climatic conditions to which books destined for the East will be subjected necessitate the employment of a non-rusting wire, such as alumenoid. 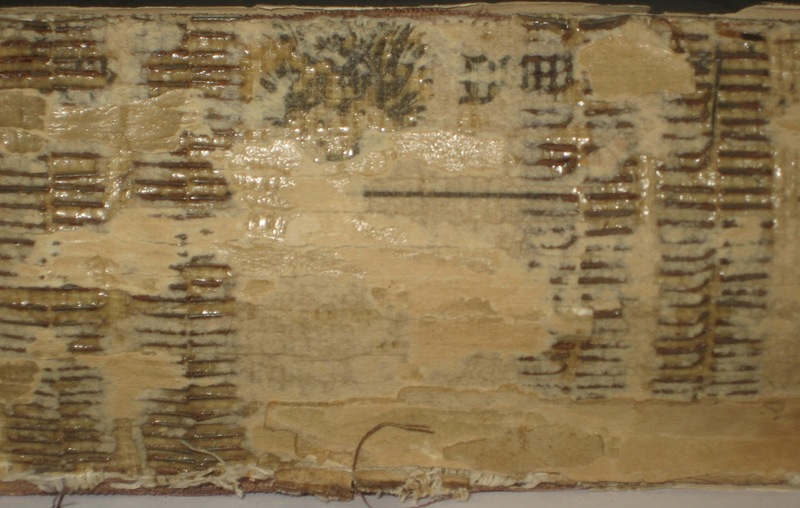 In contrast to books where the staples went through the entire textblock as in magazines and dime novels, these staples went through the fold giving the book reading properties equivalent to books sewn through the fold with thread. Applied to "mass-produced" trade books, these bindings have held up quite well with rust on the staples being the only real drawback. Depending on the wire, they can also become brittle and break when trying to open for pulling the book down to the signatures. Speaking as a conservator, and as noted in the quote above from Commercial Bookbinding, it also helps to be aware of these when cleaning the spines so as to avoid bloodying oneself. Lehrbuch der Klinischen Untersuchungs-Methoden, Leipzig 1899. 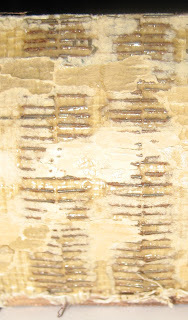 Detail of spine showing staples used for binding holding signatures to cloth spine lining. Staples sticking up after being unfolded. From University of Illinois' library conservation lab. And below the illustration from page 53 of the same book. 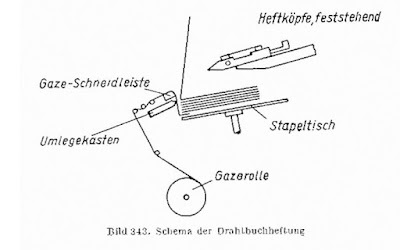 In Der Bucheinband: seine Technik und seine Geschichte, (Leipzig, 1890) Adam makes use of a different illustration on pg 41 that shows the machine from a different angle. And here the illustration from Brockhaus' Konversations-Lexikon featured in the previous post.